Lights on at Presbyterian Church on Penn St.
By admin on February 16, 2018 Comments Off on Lights on at Presbyterian Church on Penn St.
On Sunday, Jan. 28, it was evident the Presbyterian Church on Penn St. which has been empty and unused for so many years was quite active on a Sunday afternoon, January 28. The lights, in the form of hanging chandeliers inside, were brightly lit, cars filled the paved parking area, and the overgrown shrubbery had been removed to show the clean lines of the architecture, namely the porch. Members of the community have been responsive and two dropped by and informed the newspaper that they had attended the worship service there. Bob Brown and Gary Bainton (Bainton a Presbyterian minister himself) had been drawn to the building, wondering about its empty look, and were pleased to join in the service that Sunday. As for placing the congregation in Presbyterian terms, they are members of the Covenant Presbyterian Church denomination. The congregation is known as the Foothills Christian Assembly as noted in their worship bulletin. Having this church building in use brings an added warmth of fellowship to the community. Many will remember the Presbyterian Church as it used to stand on the corner of Lynch and Simpkins Streets. The old church was a wooden structure and it burned several decades ago. 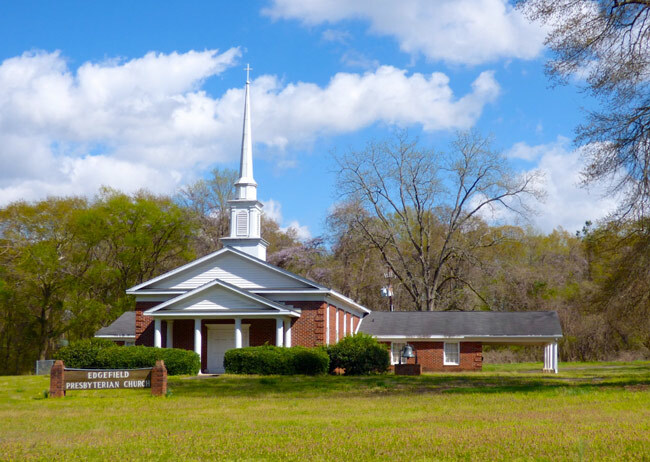 The congregation rebuilt this brick edifice on the land where the William Thurmond family had lived for many years. The Community welcomes the Foothills Christian Assembly.